SL Newser - People: Relay For Life "Skunk Aid"
On Sunday March 17th, there were a number of Relay For Life events. There was the Fashion For Life, for one. But another event was the "Skunk Aid" party. The event was held for the Relay Rockers, led by Captain Nuala Maracas, which had been targeted by someone in the Relay's "Stinky the Skunk" campaign. The "Moonstar Mavericks," led by Amanda Darbyshire, were also involved. The event was from 5 to 7PM at Arinultra Cay. OK You Allllll... You Skunked the Rockers, so now its time to celebrate with the first EVER Skunk Aid.. its a Black and White 60s Party coming up at 5pm in Arinultra Cay. Music by Yours Truly. Come let Stinky know we love him, but Just Like Cancer.. its time to Move On! No reporter was there at the scene, though details could be read in Relay chat, "STINKY!!!!!! … Moonstar Mavericks also got a visit from Stinky. … Stinky is a cute skunk, too." "I'm a doctor, not a skunk herder." "STINKY!! He's not visiting the Rockers. He LIVES with you." "As a Noob this year, Im wondering who Relay Rockers tiffed off to have us Skunked so many Times!!?? "Well, you know what they say. Old homes are sturdy homes. And, Stinky decided he wanted to move into the sturdiest home in Relay." "Hahahaa, I first read that as 'old homes are stinky homes.'" "Hell I don't know, all I know is we have been skunked until Summer!!!" "I think they wanted him...maybe even paid him to stay…*winks* " The Relay Rockers had been given more than the standard five day skunking. Trader commented, "Yep! When Life gives you Lemons you make Lemonade.When Relay Gives you Skunks you make .... T-shirts and hold a Skunk Aid Party! … Rockers and Mavericks come get your shirts and hats! Cancer Stinks!!!" For a 50L donation, one would get a "Cancer Stinks" T-shirt. There were also skunk caps one could get for free just for showing up. The comments continued, "The two team captains are dressed as skunks....lol.. too funny!" "Yep.. Stinky Maracas. And Stinky Darbyshire." Trader sent me a few pictures which showed some of the funnery. Nuala had donned a fursuit over her avatar. 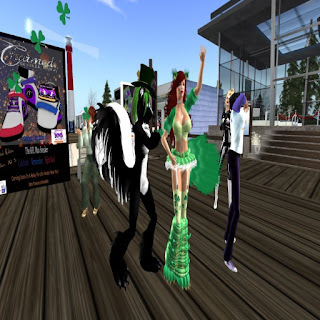 Amanda had changed from human to furry with a Luskwood skunkgirl avatar, sporting green hair as it was St. Patricks Day. Later on, I chatted with Trader about the event. "(We) raised about 8g and got Amanda unskunked," he told me, "We are using nothing but skunk kiosks. We had a good time (laughter). … We had people popping in and out. Lots of teams were represented. It was a cooperative event between Relay's oldest and of its newest teams to rid ourselves of Stinky. It showed true One Team spirit!" "The jokes were bad," he added, "the usual road kill jokes, 'what color does SkunkAde come in? : Purple of Course.' (laughter) And I played 60s songs like 'White Rabbit,' 'Black Is Black,' 'Whiter Shade of Pale,' 'Paint it Black,' (and) wrapped with 'Ebony & Ivory.'" Trader commented he might have added songs like "That Smell," "but it was a 60s show." So what was the craziest moment? "Well, Nuala Maracas in a Skunk gut doing 'Gangnam Style' was interesting (laughter). I am glad no one took a picture of me in my Family tartan kilt , a grey 'Cancer Stinks' Shirt, and a Stinky Baseball cap." "It was a fun event. It shows the special quality of Relay For Life of Second Life... Regardless of your team, regardless of where on the globe we are all one team, sharing the same dream: a world without cancer! Stinky is a fun addition to Relay! Now that doesn't mean we want him to be a permanent tenant at Arinultra Cay, we don't mind him staying for a visit!" Checking the Relay Rockers team page, someone had put up more cash to have the team skunked until April 5th. But more donations came, so by the time of this article's publishing the date had been moved back to March 30th. The fundraising boosts have raised the Relay Rockers' total to over $139,000 Lindens raised, or over $550 US dollars. The Moonstar Mavericks aren't far behind with over $129,000 L raised. Both are Silver-ranked teams. At over 51,000 Lindens raised, the Steelhead Salmons are halfway to Silver. There were other events that day, such as a bumper car rally. One of the leading teams, Harmony of Hope, was issued a challenge when one fox resident offered to go pink if the 200,000 Linden mark was crossed. It was, and he did. For more information, check the RFL in SL website.